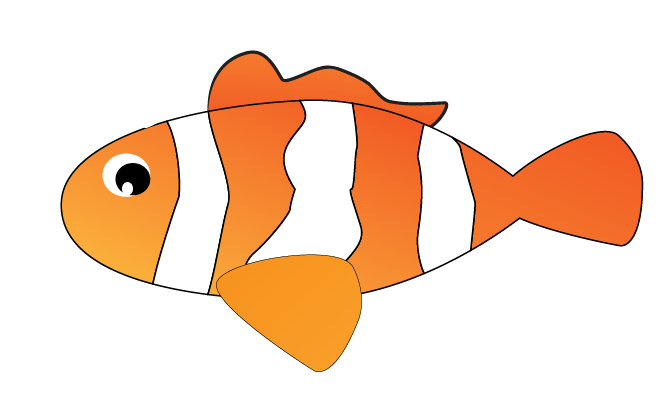 If ever you need a fish graphic for your brochure print, poster or booklet printing designs, it is best to always go vector. Why? Because vectors are easily scalable, with little to no risk of distortions, especially if you want to print them. That is why it is better to learn creating your own graphics in vector form using software like Adobe Illustrator. 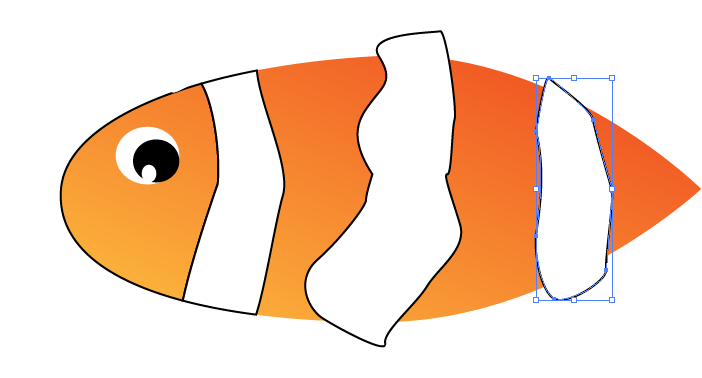 In this tutorial, we will teach you how to create your own vector clown fish graphic using Illustrator. 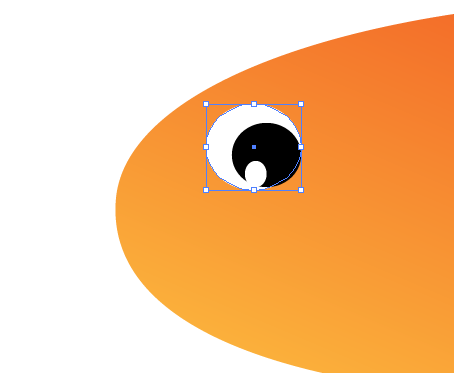 It is easy once you know the specific steps that you need to create the vector shapes. Just read the steps carefully below and you will see how easy it is to do graphic vectors for your poster, flyer and booklet designs. 1. 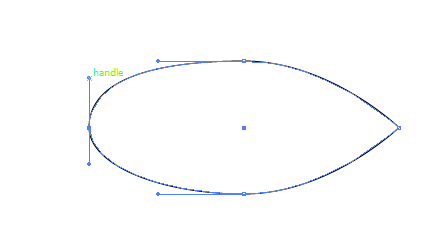 With a new document in illustrator open, simply draw a wide style ellipse by using the ellipse tool. 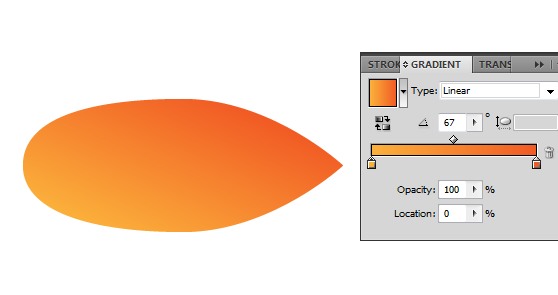 Find it in the tools panel and simply click and drag the shape unto the canvass. 2. Now, click on the Direct selection tool. 3. 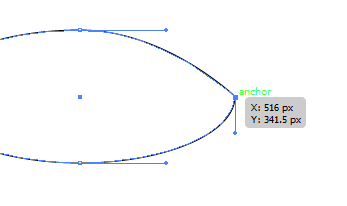 Click on the anchor in one side of the ellipse. Then click on one of its handles. Reduce the scope of the handles by dragging them toward the original anchor. Do this for both handles to create part of the tail. 4. Next, do the opposite for the opposite side. Increase the scope of the handles a bit to create the face. 5. 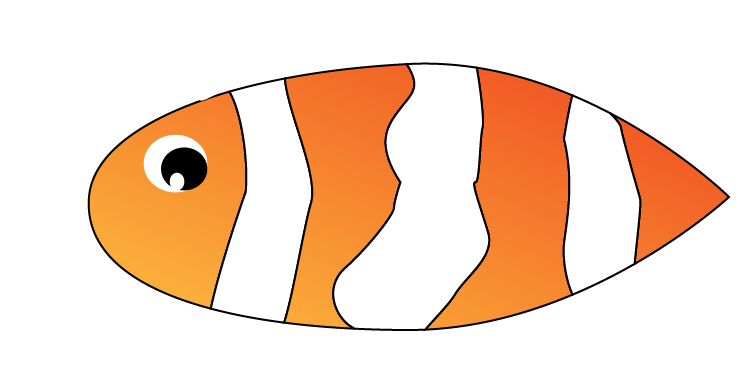 Now, let us add an orange color gradient to this shape to establish the body of our clown fish. 6. Next, we shall add the eyes. Simply draw three circles. One large white circle, one smaller black one, and one even smaller white for the glint of the eyes. Just look at the image below for reference. 7. Now we shall add white stripes, much like how clown fish have. Use the pen tool to draw a random, oddly figured stripe. Color it white and then place it across the body of our fish. 8. Now, with just repeat creating stripes across the body. Add a black stroke to them and the body to make them look more visible. 9. Then, select the body and the stripes and click on divide in the pathfinder tool. This will divide your fish body and stripes along with the intersecting paths. Just delete the excess to get the full body correctly. NOTE: when deleting the excess, make sure you “ungroup” the shapes so as not to delete everything. 10. Great! 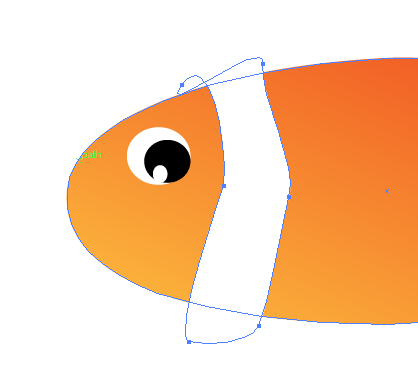 Now, just use the pen tool to add the fins and tail. Make sure you color them like the body of course. For the tail, you can merge it with the tail part of the body by just selecting them both and then choosing “unite” in the pathfinder tool. 11. 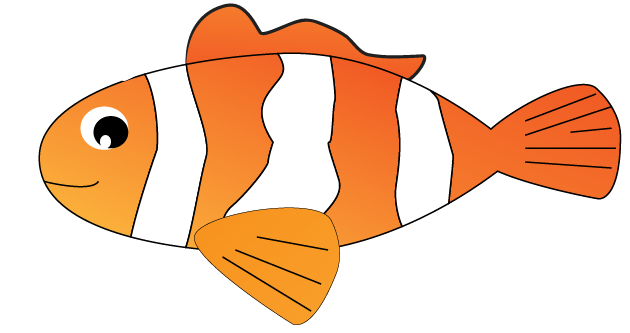 Finally, just add a few lines for the fins, and a smile for the mouth to finish our cartoon clown fish.